To visit this course's website click here. Bucks Run in Mt. 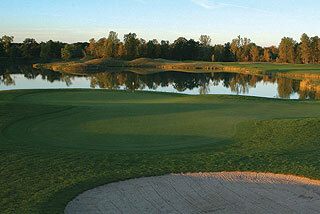 Pleasant - just 4 miles from the Soaring Eagle Casino, is without question Mid Michigan's premier golf facility. Pulling off the drive from Chippewa Road, just 1/2 mile from Highway 20, one is immediately impressed by the view of the beautiful wooden beam clubhouse and surrounding vistas, featuring the ninth and 18 holes winding around a picturesque lake. A visit here should include a leisurely arrival, allowing for practice time on the 5 acre grass range, with a choice of two large putting greens - and perhaps lunch or dinner in the dining room or terrace of the 18,000 square foot clubhouse. Here is a tip - the cheeseburgers available at the outdoor grill or inside the lounge are the best we have sampled. 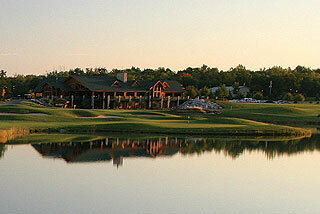 A unique feature at Bucks Run is the putting course, located on an island between the clubhouse and third green. A pre or post round experience on this 18-hole layout can help to start or cap an eventful day - and is the perfect place to settle a friendly wager or initiate a skins game for golf groups. Inside the clubhouse golfers will find locker facilities with showers for men, a lounge with a full selection of alcoholic and non-alcoholic beverages, dining room with a lunch and dinner menu, full service pro shop with attractive Bucks Run logo attire and golf accessories - and a outdoor deck featuring gorgeous panoramic views. The banquet facilities can accommodate groups of up to 250 people, and provide an ideal setting for special events including weddings and golf outings. Honestly, if the Two Guys Who Golf could design a golf facility that we would be completely satisfied with and proud of - this would be it! Great location in the center of the state, incredible design that is challenging but fair, and top notch facilities - throw in the courteous and friendly service and you have a real winner. 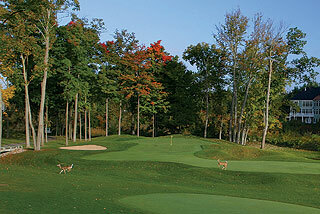 Without question - Bucks Run is in our books, a top five golf course in the state of Michigan! Jerry Mathews has designed some wonderful courses, and Bucks Run has to be one of his best (if not the best of his) efforts. Anyone who plays a lot of golf knows that some courses have a special "feel"; something that separates them from other layouts. Bucks Run creates a tempo that allows one to start softly, provides significant challenges in the middle holes, then smacks you in the chops in the closing holes on both the front and back sides. You are not confronted with the number 1 or two handicaps on the first holes, but have some time to work your way into the round, realizing that your best effort is demanded as you make the turn and finish up. Aesthetically, the course is beautiful. 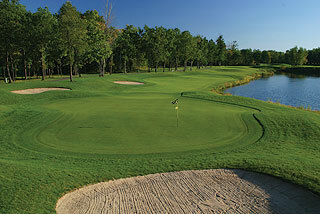 Sculpted tees, fairway and greens are complimented by soft sand bunkers and playable rough. The Kirby marking system is in place, and stakes are visible at 100, 150 and 200 yards. Sprinkler heads are measured to the center of the green, and markers on the flag sticks indicate front, middle and back pin placement. All carts are equipped with a GPS which provides accurate information from tee to green. The scorecards provide hole diagrams with useful measurements. There is a good mix of holes bending in both directions along a terrain that is mildly rolling with three large lakes, natural wetlands - and a river runs through it! Four sets of tees allow golfers to play from a distance that fits their game. The blacks measure 6914 with a 146 slope, followed by the whites at 6366 yards , the golds at 5861, and the forward tees at 5073 with a 127 slope. The white tees are very playable for the male mid handicapper with only 2 par fours of 400 yards plus, and some reasonable par threes. Number one is a wonderful and greatly appreciated opening hole. Play it safe down the center or cut if off a bit to the left - either way should create a good par or birdie opportunity. The second is the # 3 handicap, but is playable if you can land an accurate tee shot just left of the lake. The hazard juts into the right side of the fairway near the 100 yard marker. The par five third is very score-able although most will play it as a three shot hole. Warm up, hit some good shots on number two, and you can be on your way a great beginning. The par 3 fourth is a tough one. With water left and trees/mounding right, there is little room for error. Short right is a bail out option. The 150 yard stake is the place to be off the tee on the dogleg left fifth. Long hitters can bend one along the tree line and cut off significant distance here. From an elevated tee there is plenty of fairway on six, which narrows considerably on the way to an elevated putting complex. This is a good scoring hole with the rough along the right side being very playable. Bunkers short left past the tree line should come into consideration for those wishing to cut some distance from the par four 7th. A shot right of the tree line to near the 120 yard marker is the safe play - creating one of the best birdie opportunities of the round. Pay attention to the pin placement though, as the green is two-tiered. There is not much room for error on the par three 8th - which is nearly all carry over a pond. There is a bit of room long left. 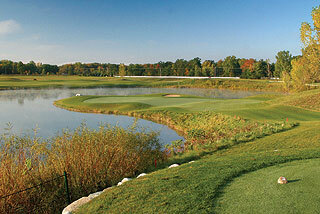 The ninth is a pretty par four that doglegs right over the edge of the main lake. A straight long drive will go through the fairway - aim to be just right of the left fairway bunker, and hopefully the wind will not affect the approach over water. The back side begins with a dogleg left par four, which invites a lay up just left of the large rock in the back center of the fairway - best not to try to cut this shot too much as the trees along the left can be troublesome. Eleven bends in the opposing direction and also is tough to cut. Place it strategically and pay attention to the pin placement as the putting surface is ridged on the right. 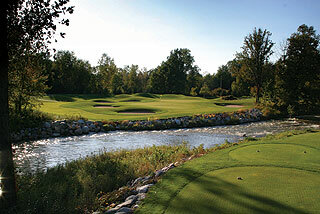 The water hazard along the right side comes into play for long, stray shots off the tee on 12. The fairway slopes towards the marsh and a tight green complex surrounded by grass swales, bunkers and trees makes this perhaps the toughest approach of the day. 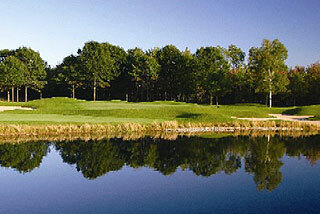 Par it and get out of town - birdie this hole and make plans for the casino, as this is your lucky day! Thirteen plays uphill but is a good scoring hole, and is followed by a beauty of a par three, which plays from an elevated tee. There is lots of room short and the green is spacious. Number 15 plays back uphill and presents a short carry over marsh off the tee and tight approach. Redemption should be yours on 16, which is a very short and playable par five - and in our estimation the easiest hole on the course. 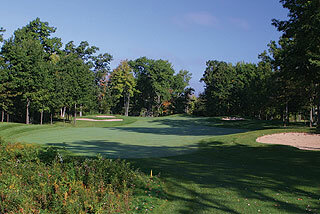 This precedes a gorgeous par three over the Chippewa River to a sloping putting surface (3rd picture in this review). Hold onto your hat on 18. Many will feel like they have accomplished something off the tee when they land their ball on the short grass over the lake. Prior experience will help golfers discern where to aim, with the 2 fairway bunkers through the fairway the target for most. That will leave an approach of around 200 yards or more to a green flanked by water on 3 sides. A lay up will be he play for most, with hopes that a wedge or short iron will get them close enough for par on the third shot. Only the longest hitters have a shot at birdie on this hole, which measures 444 yards from the white tees! Immediately after playing this course, I wanted to start over. It is that kind of layout - beautiful, challenging and fun. Anyone who played it in the first year or so, will be happy to know that the putting surfaces have softened up and hold approaches quite fairly now. Bucks Run is worth the drive in itself. Combine it with a casino trip play on some of the areas other quality layouts and it can be the highlight of a very enjoyable golf vacation. We like it so much that the Two Guys Who Golf plan to include Bucks Run on our schedule of courses for our annual charity golf tournament. We cannot think of a finer facility from which to run this event. This one is HIGHLY RECOMMENDED! Play it! Check out the Two Guys Who Golf detailed information page on this course (which includes a link to the course's website if available) - click here.